These heels run narrow, please consult this sizeguide to choose your IF size in these. If you are in doubt, please compare sizing with one of your own heels (not your foot). We measured all the shoes and gave the best fitting sizes in our suizeguide. New fall / winter collection from Iron Fist! 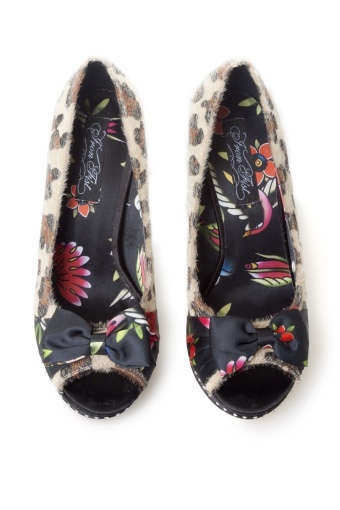 Love Bites Heel Leopard. Love won't bite in this seducing style. Edgy heels in leopard print with a 4 inch heel and a 1/2 inch black platform with a rhinestone trim. 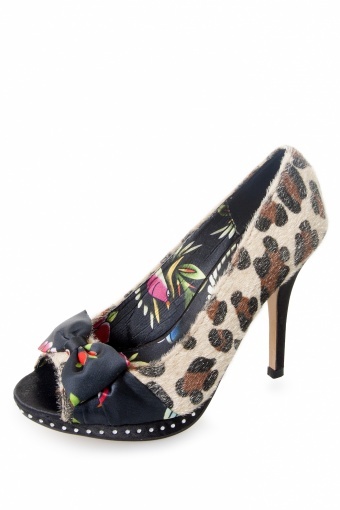 This style has a black satin bow with a multi colour print at the vamp to show off the ferocious fur, grrr! !